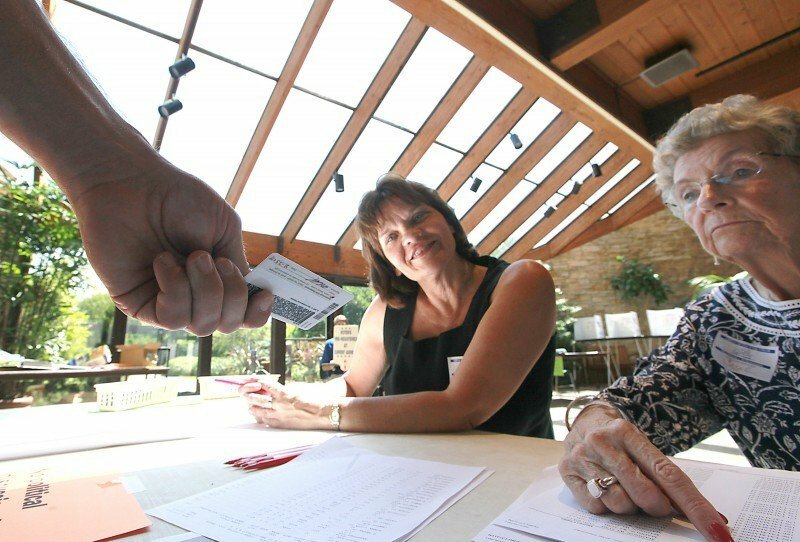 Poll workers Sharon Lewandowski, left, and Carol Rickey asked voters at Olbrich Gardens in Madison if they had photo identification cards as part of an educational effort in the July 12 election. Starting next year, no one will be allowed to vote in Wisconsin without a picture ID under a law signed in May by Gov. Scott Walker. 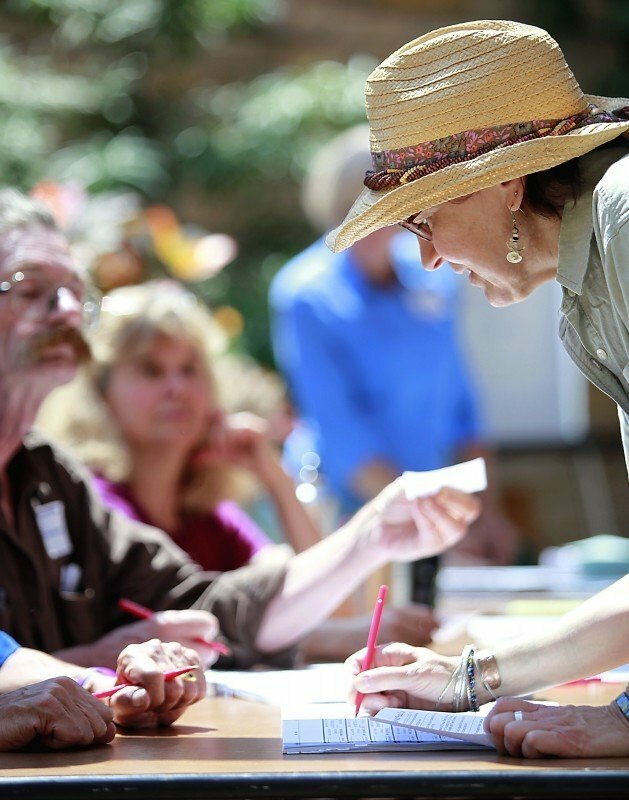 Julie Rheault signs a voter log in the polling place at Olbrich Gardens in Madison before voting in Tuesday’s election for state Assembly in eastern Dane County. Voters were required to sign the log as part of a state law signed in May by Gov. Scott Walker. Another provision of the law, requiring photo ID, takes effect next year. Some Madison voters voiced displeasure about the state’s new voter ID law during a practice run Tuesday, but most seemed to take changes in stride, poll workers said. By early afternoon, about 50 of 275 voters at Elvehjem Elementary School told election workers they had no identification with them, said Robin Piper, chief poll worker at the site. Kim Garrett, who voted at La Follette High School, said she and other voters who don’t like the law have been planning to protest by saying they had no ID. Gov. Scott Walker signed the law on May 25. Starting next year, no one will be able to vote without showing a picture ID, such as a driver’s license or a voter card available from the state Department of Motor Vehicles. Republicans have long fought for the requirement, saying it would reduce voter fraud. Democratic opponents said there is little such fraud, and the law will only serve to discourage voting by college students, seniors, minorities and people with disabilities. In Dane County, the only election Tuesday was for a state Assembly district that covers fewer than 40 wards in Madison, Monona, McFarland and the towns of Blooming Grove and Dunn. Election workers asked voters if they had ID and distributed information on the new law, but everyone could vote. The law also requires voters to sign a poll book. That requirement took effect Tuesday and caught many voters off guard, said county clerk Karen Peters. Peters said things went smoothly, but she predicted long lines and delays for voters next year when poll workers will have to check photo IDs. “It’s going to be horrendous,” Peters said. After voting at Lake City Church on Buckeye Road, Gary Herrmann said he was glad election clerks were using Tuesday’s election to prepare for the change. He said he doubted large numbers of voters would be discouraged by the new law, and he wasn’t persuaded by statistics indicating little voter fraud takes place in Wisconsin. “I really don’t care (as long as the new law) gives people a better feeling of the integrity of the vote,” Herrmann said. Steve Klafka, who voted at Olbrich, said the law won’t bother him, but it will hinder others. “We should be encouraging people to vote and participate,” Klafka said. Election officials across Wisconsin are bracing for a difficult transition as the state rushes into place new rules for voting signed into law by Gov. Scott Walker Wednesday — including a controversial measure requiring voters to use photo IDs. The DMV estimates about 70 percent of the 98,000 state residents who get photo ID cards each year will now get the cards free. Consequently, the state projects an annual revenue loss of $1.9 million to its transportation fund, which is separate from DMV's budget. Gov. Scott Walker's administration is working on finalizing a plan to close as many as 16 offices where people can obtain driver's licenses, in order to expand hours elsewhere and come into compliance with new requirements that voters show photo IDs at the polls. State Department of Transportation employees have been instructed not to offer free photo identification cards to people unless they specifically asked about them first.